Laura Brody is a rising senior from North Carolina pursuing majors in both International Comparative Studies and French Studies. Her research will answer the question of how divisions within Greek Cypriot nationalism are represented in the Museum of National Struggle on the Greek Cypriot side of of the island’s divided capital Niçosia. In addition to this case study, she will conduct interviews with former EOKA/EOKA-B members, scholars of Greek Cypriot history and museum curators across Cyprus. 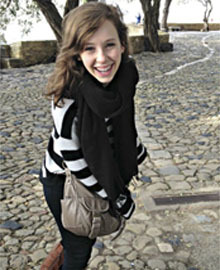 She will also spend the summer working as an intern at the Association for Historical Dialogue and Research in Niçosia. This project will contribute to a thesis regarding memory politics and internal division in nationalist movements within divided societies such as Northern Ireland and Cyprus.